There are still a lot of good and catchy names / keywords available for MY domains which you can’t get for general TLDs like .COM and .NET. Why Register / Buy a MY Domain? .MY domain increases customer trust because only legally registered businesses in Malaysia or Malaysians are qualified to register. With higher credibility, your website can rank higher in local search results when someone searches for your business locally. .MY domain, a Malaysia country code top level domain (ccTLD), is now extremely popular among registered Malaysia businesses as it shows the identity of Malaysia, a land of great business opportunities and stability. Don’t let your competitors get ahead of you. In today’s brand conscious world, your brand is of paramount importance! .MY domains tell your customers that you are from Malaysia, a land of stability and ample business opportunities! Better name, better results that focus on business. 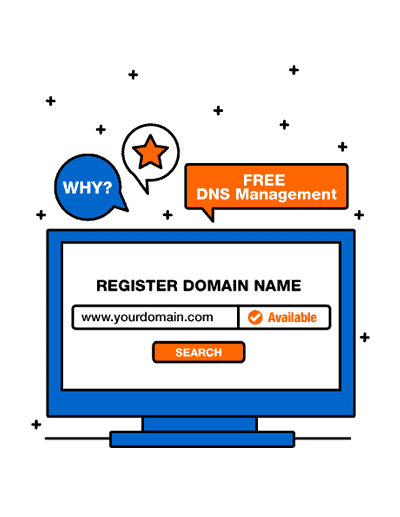 Do You Have An MY Domain? Why Register/Buy a MY Domain? The .com.my domain, a Malaysia country code top level domain (ccTLD), is now extremely popular among registered Malaysia businesses as it shows the identity of Malaysia, a land of great business opportunities and stability. Moreover, a .com.my domain increases customer trust because only legally registered businesses in Malaysia or Malaysians are qualified to register. With higher credibility, your blog, e-Store, or website can RANK HIGHER in local search results when someone searches for your business in GOOGLE.COM.MY. It all begins from your domain! Get a Catchy MY Domain, Protect Your Privilege! There are still a lot of good and catchy names / keywords available for MY domains which you can’t get for general TLDs like .COM and .NET. Don’t wait anymore! Let’s check the availability of your preferred domain now! Register/buy your MY domain name NOW to protect your privilege! Why is having a Malaysia Domain Important? Reach out Better to Local Customers and Gain their Trust. Domain is a must to kickstart a website, forum or blog. Secure the trust of your customers and reach out to local market better than your competitors! What is more? MY domains help greatly in the listing of your business profile in local directories. You may ask, what is the big deal when your brand or company doesn’t have a domain? The fact is, your brand/company’s domain can be taken by your competitors if you do not act fast. Set yourself apart from the competition! Grab Your Malaysia Domain Ahead Of Your Competitors! Your business and customers will be stolen! If they go for your competitors instead of you, you will lose the business forever! In today’s brand conscious world, your brand is of paramount importance! Your Domain name signifies your BRAND and makes people remember your company and make recurring purchases. Secure your domain TODAY to secure your BRAND and CUSTOMERS. MY Domains tell your customers that you are from MALAYSIA, a land of stability and ample business opportunities! In addition, your domain increases your company’s credibility and strengthens your corporate identity. Now, the price of .MY Domains is slashed to the lowest prices possible – get 2 years and FREE 2 years for only RM240. You SAVE as much as RM240 when you register! The MORE domains you register, the MORE you Save. Act now! Don’t wait anymore! Grab your favourite .MY Malaysia Domain NOW! Register TODAY to win Customer Confidence and Loyalty, and avoid PAYING MORE in the future! What is the requirement to register .MY and .COM.MY domain? How Domain Life Cycle Works ? Domain de-activatedYour domain will be de-activated upon domain expiry date for 30 days. Available for registrationThe domain is now re-open to public for registration. Anyone can register for this domain name on first come first serve basis. Promotion price is applicable to new registration only. For renewal, the price will be reverted to the default price. TWO – 5yrs TLD domain FREE Powerbank promo is not applicable to .name.my and .space domain extension. TWO – 4yrs and above .MY domain FREE Powerbank promo is not applicable to .name.my domain extension. Get 4 years of MY Domain for the price of 2 years only! Promo ends on 30 April 2019. Promo prices are for first domain registrations only(first-come, first-served basis). For domain renewals, prices will revert to normal. This offer is open to only Malaysian Citizens and Businesses Registered in Malaysia. For *.my domain registrations, please email your company’s Form D/24 or 49 or Malaysian IC to domain@exabytes.my when requested. Kindly remember to state the domain name you wish to purchase. Exabytes reserves the right to cancel your domain and payment if supporting documents are not received. Domain registration fees are strictly non refundable if exceeded the 3 days Money-Back Guarantee validity period. Promotion is subject to .MY Domain Registry Terms and Conditions. View our terms of service here.